I am a self-proclaimed peel-off mask hater. And anyone else who has fuzz on their face would agree: The removal videos are satisfying to watch, but not so fun to try at home. Anything that claims to unclog your pores without an ounce of pain, in my experience, is total b.s. — well, at least it was. The irony isn't lost on me that the brand that proved me wrong is called No B.S. (it actually stands for "no bad stuff," but you get what I mean). And although it didn't detox my skin back to a state of poreless perfection, it also didn't hurt one bit — and in my book, that's a win. Exclusively launching on Amazon today in honor of the site's Prime Day promotion, this face mask is sure to sell out. It has the unclogging appeal of other black peel-off masks, but this one is virtually painless (seriously, I didn't feel a thing) and contains the beauty industry's darling, charcoal. The magic ingredient is the secret to this mask's success — which alone wasn't enough to pique my interest. But combined with squalane (which improves skin elasticity and helps maintain moisture) and garden cress extract (which aids in hyperpigmentation and delivers a heavy dose of antioxidants), you've got a radical, damage-repairing, skin-softening mask that can help with anything from cystic acne to dull, hangover-induced skin. No B.S. 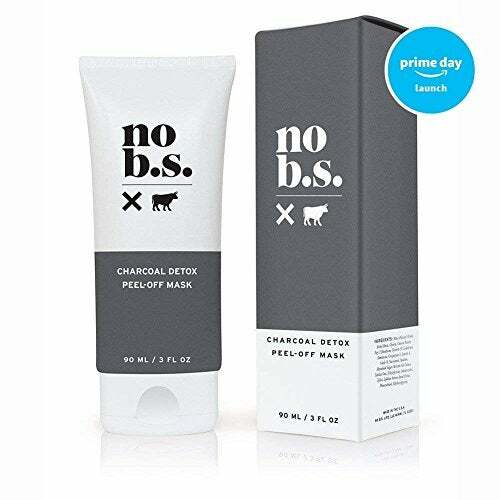 Charcoal Peel-Off Mask, $45, available at Amazon.